How often do you find yourself sending out tired snapchats right before you go to sleep? Or sending a goodnight text to your honey? These are just a couple of things common people do right before they go to bed, but the question is where does and where should their phone go once they are done and ready to go to sleep? Sleeping with your phone under your pillow is not only hazardous, it could be deadly. Cell phones, tablets, and other forms of hand-held technology release electromagnetic waves caused by X-rays as well as microwaves which may lead to the growth of tumors. For adults, the risk is much smaller of developing a tumor which could then lead to cancer due to the thickness of the adult skull. However, for children, it could be deadly. Public Service Announcement: All parents should discourage their children from cell phone use at a young age until their brain develops more. Children’s skulls are much thinner than adult skulls, allowing a passageway for electromagnetic radiation to enter their brains. Since Children’s brains are still rapidly growing, this could be extremely perilous and even deadly in the long-run. So parents, my recommendation would be to wait until your children are at least 12 years old before letting them have a cell-phone for personal use and to take it away from them at night time. Another thing to look out for is not only to make sure your phone is away from your head at night, but if it happens to be, make sure that the screen is visible and the phone is faced upwards. The reason for this is because the back side of cell-phones secrete more radiation on their back side. You may also want to look out for long, loquacious conversations on the phone. If you’re babbling on nonsense for hours at a time with the phone at your ear the entire time, this is extremely dangerous. The longer your phone is close to your head, the more exposed you are becoming to radiation. And, if you are on the phone when there is poor signal especially, that is when radiation becomes the greatest because the weaker the signal the phone shows, the stronger the signal the phone will actually be using. So exactly how dangerous is this? There is actually not yet an answer to this question, but there are certainly multiple hypotheses. 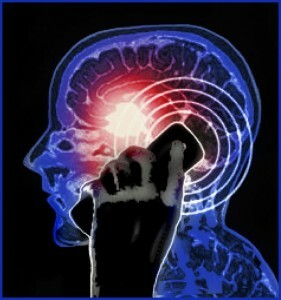 Some advice that I can give you to avoid the risk for any tumors or brain cancer is to use a blue-tooth connected ear-piece while on the phone instead of having conversations with the phone close to your head, which allows radiation to leak through. Also, avoid physically talking on the phone and try texting away from your head. When you go to sleep, make sure your phone is not under your pillow or even next to you on your bed. Put it in a drawer and turn it off. This was a very interesting read for me. My mom always told me, ever since I got a phone in the 8th grade, not to sleep with my phone next to my head. Now by reading this I have a better understanding of why my mom was so adamant about it. Although, with all of this said It makes me curious if this could happen to other parts of the body. For example, when girls put their phones in their bra, could that cause for them to develop breast cancer? Or when people have phones in their pockets, could that cause cancer in that location? Just some questions that I thought of while reading. Good job! Wow, this article was greatly informative for me. I knew it was pretty dangerous to sleep with your phone under your pillow, but never thought about how dangerous it can be even to just be on the phone for a while. Another danger about sleeping with your phone under your pillow that I heard a story about from a family friend is that she used to sleep with her phone charging under her pillow and one time the phone actually overheated so much from being under the pillow that it caused it to spark and set on fire. Luckily, she woke up right away and was okay! I always sleep with my phone on my nightstand next to my bed so that it is far enough away from me, but close enough to hear my alarm in the morning. Those of you that are used to sleeping with it under your pillow should try that instead! Also, if you do not have a bluetooth earpiece to use during phone calls, you can always use regular ear phones or, if you’re at home, you can just keep the phone on speaker or facetime. These are all effective ways of lessening the time of having your phone against your head! This post really got me thinking! Over the years I recall a lot of people arguing whether or not cellphones can be dangerous to our health just by using them in general. The idea that having them near your bedside at night and the issues it can cause is quite scary considering I charge my phone only a few feet away from me. Now I saw that your post has more risks for young children, however I’m sure that they can still affect everyone in a negative way. While googling ideas similar to your topic I came across this great article about cellphones and cancer risk. Definitely worth a look! Interesting article! I’m guilty of sleeping with my phone under my pillow–I put it on vibrate and use it as an alarm so I don’t wake up my roommate. Your article has me changing my mind about that, though! I’ve always heard rumors about cell phones creating radiation, but I’ve never been too concerned. Another thing I also do is charge my phone while it’s under my pillow, and according to this article (http://www.independent.co.uk/news/world/americas/the-pictures-that-show-why-you-should-never-charge-your-phone-under-your-pillow-a6883796.html) that’s even more dangerous. I will never sleep with my phone under my pillow again… I guess it’s time to invest in a real alarm clock! article reignites the question of whether or not cellphones do in fact cause cancer. This is an awesome article! What i really like about it is that it is so relevant to everyone in our SC200 class. I’m sure most, if not all, students sleep with their phone on their bed next to them or underneath them in some way. I am definitely at fault for that, and i know i need to fix that bad habit. As i read your post, i thought of a possible solution to this problem. “bedside buddies” are often sold with the bedding bundles we buy for our dorms. at night, simply place your phone in the hanging pockets from your bed and voila! No more radiation worries. It’s still nearby, but far enough away that it (hopefully) won’t do as much harm. This article has opened my eyes. It made me see how bad it is for your health to have your phone next to you while you sleep. I always fall asleep with my phone next to me but now that I know it has serious negative effects I am going to put it on my desk. Here are reasons why not to sleep with your phone next to you! I am so astonished after reading this as I always put my phone under my pillow and face downwards. It is said that 44% of cell phone owners sleep with phone next to bed because they don’t want to miss any crucial calls or texts. I am exactly among the 44%. I find this article related also talks about the danger of sleep with phone in the bed. This is a frightening blog post for myself and for many other students out there I am sure. I constantly fall asleep with my phone near my head. I had no idea how bad this was for my health down the road potentially. I had always heard some rumors that it wasn’t good to have it so close when you sleep but I though they were strictly based off of the fact that your phone distracts you from getting sleep. The good news is that our generation isn’t having many long phone calls at least.